Get chic summer flip flops for as low as $29. This sale last until their inventory is out. Brand names like Yellow Box, Ziggy and Flex. On Monday, July 12, the entire stock of Spring and Summer merchandise will be 50-70% OFF! The boutique owner Lesley Hern says this is the biggest sale of the season. You don’t want to miss it! Save 25% right from your computer! 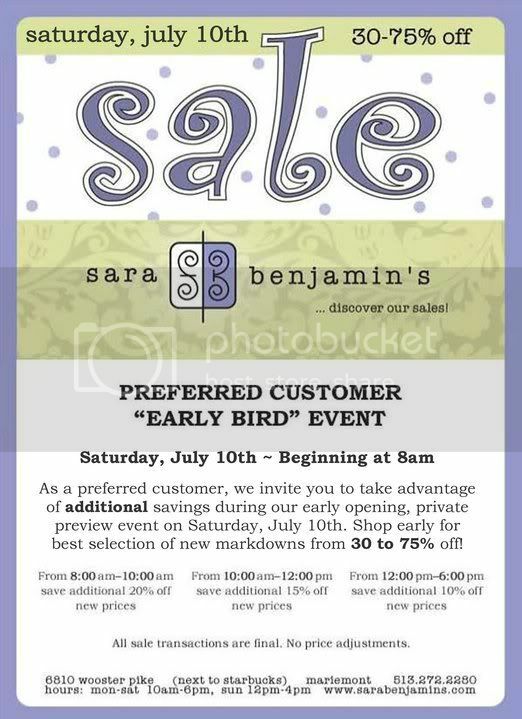 This sale is online only on Sunday, July 11. Click your way to savings! Beat the Heat and Save! French Connection is one of the top women’s fashion brands, and obsess boutique has a great stock of their best designs. (I think the owner’s daughter works at French Connection). Plus, you get a savings of 15% off of the regular price! All designer denim is on sale at 15% off also! Obsess carries Citizens of Humanity, Fidelity, Joe’s, James Jeans, and Anoname. You can’t beat the fit and style of these brands! Hurry, because this sale ends July 14 (which is Bastille Day… aka the “French Connection”! oh, I crack myself up). The largest sale event of the year at Nordstrom starts next Friday, July 16. New fall clothing, shoes and accessories for women, men and children will be on sale for two weeks and then marked to regular price on August 2. Shop from brands such as Guess, Sam Edelman, Stuart Weitzman, Steve Madden, UGG Australia, Nike, DKNY, MICHAEL Michael Kors, Lafayette 148 New York, Elie Tahari, Kenneth Cole, Kooba, BOSS Orange, Lacoste, True Religion and more. All the greatest boutiques will be under one roof, for three amazing days. Well, technically four if you count the sneak peek night. Make sure to stop by, you have so much to choose from! Join the Linder Center of Hope for a preview evening event! Enjoy an evening of fun, fashion and a great fundraiser! Each boutique will preview the designer looks and accessories that the Cincinnati Boutique Sale has brought at incredible discounts! $25 admission for this special night with wine and light hors d’oeuvres served.